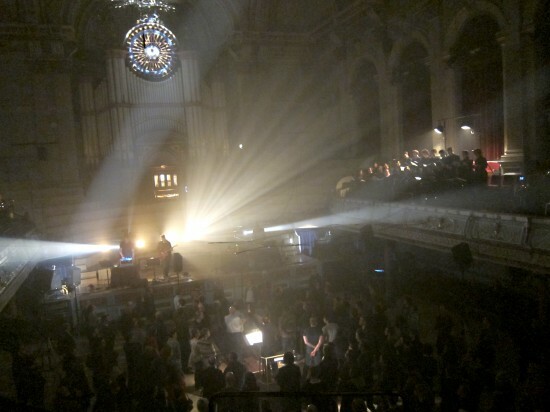 Crepuscular Hour is a one hour long piece to be performed in a cathedral or similar with musicians surrounding the audience. 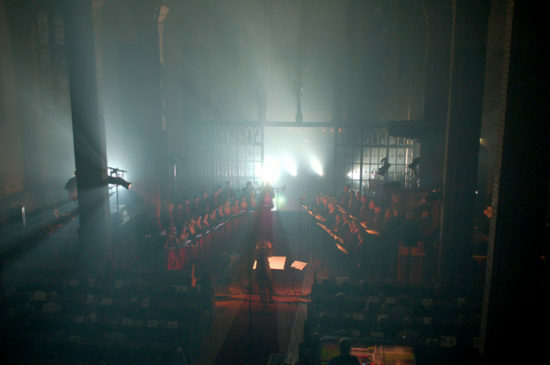 The piece is written for three choirs, three pairs of noise musicians and church organ. 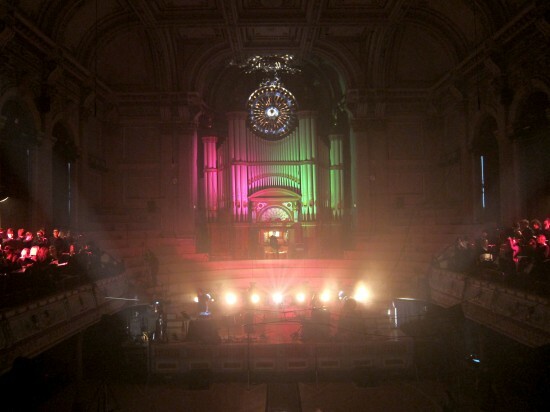 The room will be filled with sound in an intense, but almost meditative hour, where the voices blend with the distortion, the noise sometimes taking over, and the organ eventually hoisting the music to new dramaturgic level. 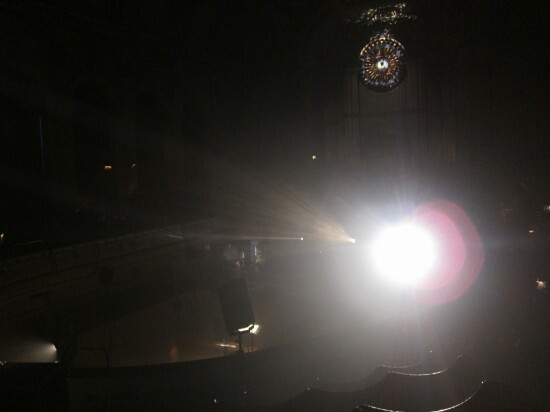 The piece is inspired by the phenomena ‘crepuscular rays’, which is when rays of sunlight stream from one point through gaps in clouds or other obstacles. The name comes from their frequent occurrences during the ‘crepuscular hours’ (Crepuscular comes from the Latin word “crepusculum”, meaning twilight), when the contrasts between light and dark are most obvious. The visual design of this concert is a play on the phenomena, as I want the light to be filtered by the obstacles and musicians in the room. ‘Crepuscular’ is also a term used to describe creatures that are primarily active during twilight, that is at dusk or dawn. 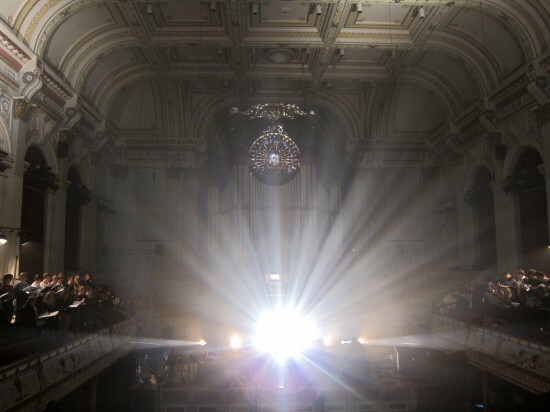 Crepuscular Hour was premiered at the Ultima Festival in 2010. 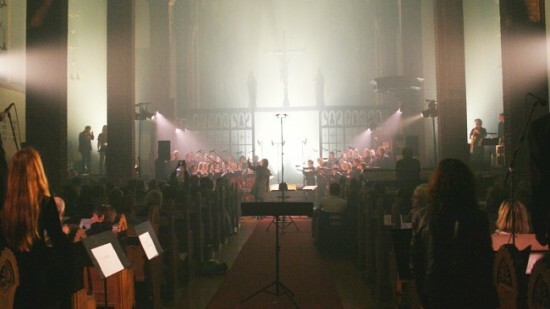 It took place in Uranienborg church in Oslo. This was broadcast by Norwegian radio. 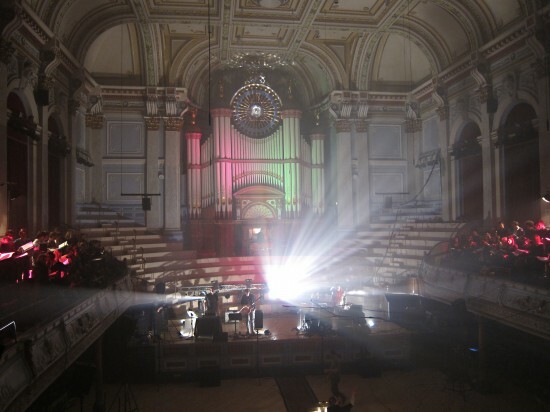 The next realisation of the piece was at Huddersfield Town Hall under the Huddersfield Contemporary Music Festival 2012. This performance was also recorded and is released on DVD with a 5.1 sound mix, released by Rune Grammofon. Pictures above from the first performance. 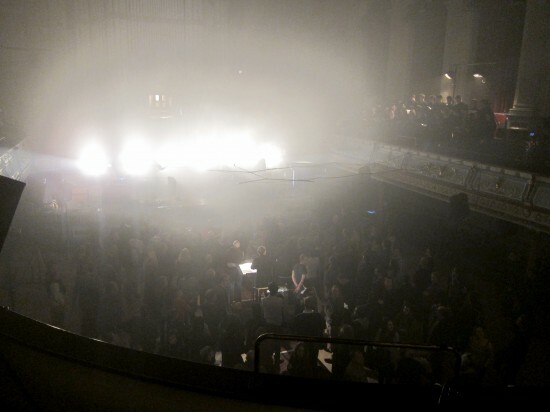 Below are some photos from the performance in Huddersfield. All photos by Lasse Marhaug. The musicon the CD ‘Crepusculear Hour’ is simply wonderful. I’ve been following your work for a long time, and this is another reward for doing so. Will be out on DVD in (not too) near future! So please stay tuned. And many thanks for kind words. Mesmerizing, Hypnotic, Beautiful, Fascinating, Awe Inspiring and Meditative. I Need This On DVD, CD and Download. More Please. And Thanks. Dear John, it will be released hopefully this year! Many things to consider, but that’s the plan. Thanks a lot, both of you! What a stunning piece. I was left mesmerized. What an incredible piece! Any info on the forthcoming DVD?